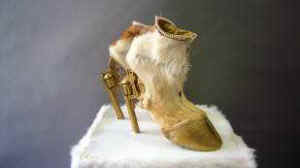 Animal Parts: High style or Just Plain Beastly? It started with mink stoles and snout-to-tail cuisine. Now hipsters are going whole hog, donning road kill as accessories and cow hooves on their feet. But is the phenomenon a real artistic movement – or just plain beastly? When she cycles along London's winding streets, Reid Peppard keeps her eyes peeled for road kill – pigeons, mice and rats that have met an untimely end under the wheels of a car or lorry. If she spots one, it is popped into her bag and then into her chest freezer at home. Among the pieces showcased on Peppard's website are a pigeon-wing headpiece that makes the model wearing it resemble a dapper if morbid Hermes. In his hand is a stiff white rat whose belly snaps open to reveal a velvet-lined change purse. Another rat sporting Swarovski crystals where its eyes once were dangles from a watch chain, while two others have been fashioned into fuzzy cufflinks. Well beyond runway fur or the fat raccoon tails that hipsters have taken to slinging from their heads or tights, dead animals are being fetishized in both underground and mainstream culture to a degree not seen before. Working with animals not typically associated with taxidermy or with normally discarded body parts such as skulls, bones and claws, fashion designers and artists intent on conveying broader messages of both mortality and sustainability are creating unique and – if you're not squeamish – wearable memento mori. In New York, Theresa Dapra's work includes goat-hair wristlets and mink-skull headpieces. Like chefs who embrace the equally popular snout-to-tail style of cooking, they all espouse the philosophy that deceased animals should be used in their entirety. Of course, not everyone sees the artistic merits. Peppard, the young London-based taxidermist, has received hate mail, even though she only uses road kill, critters fallen victim to pest control or those dead of natural causes. At the same time, her pieces, which sell for up to £3,000 ($5,200), have attracted numerous, often influential admirers. One of them, Lady Gaga, wears two of the designer's headbands in her Bad Romance video. Staunchly anti-fur, the singer has embraced the pieces because they are ethically sourced. “I get all the mice from my cat Panasonic. She's amazing,” says Peppard, whose next collection, called Park, will feature animals culled from London's many green spaces. This includes squirrels, ravens and foxes, which Peppard will turn into handbags. Among foodies, the appetite for animal parts has found a counterpart in the recent yen for offal and now-ubiquitous charcuterie. At the celebrated Montreal brasserie Au Pied du Cochon, standard fare includes deep fried pig jowls, pigs' feet stuffed with foie gras and, for the romantically inclined, “Pigs head for 2.” In Toronto, a voracious public appetite for chef Greg Van Gameren's charcuterie has forced the Black Hoof to open a café across the street, where people wait until a table is available. The restaurant has introduced Torontonians to every possible culinary use for a pig, from stuffed snout to crusty pig ears to pig tail stew. “A big [part of the cuisine] has to do with using the whole animal out of respect for it,” says Van Gameren. In fashion, the use of typically discarded animal body parts such as skulls and bones has darker appeal, one many artists downplay in favor of touting their morally sourced materials. Many, such as Toronto designer Lori-Anne Krausewitz, are vegetarians; she uses real bird crests, bones and hides in her headpieces, some of which she sells at Shopgirls and Model Citizen in the city and Lustre Boutique in Montreal. “I know certain vegans would be absolutely appalled – even meat eaters might question what I'm doing. But I don't think animals, alive or dead, should be seen as grotesque, ugly or morbid. It's giving a new life to something that would normally be thrown away,” says Krausewitz. In that vein, she hopes to soon be salvaging quail skulls from local butchers. “As long as other parts of the animal are being used for other reasons, food being a huge one, it does make sense to make use of the byproducts,” says Sarah Jay, fashion director at Fashion Takes Action, which promotes green materials and methods in the fashion industry. For a few years now, animal fixations have been creeping into home decor, from Jason Miller's antler chandeliers to Carolyn Salas and Adam Parker Smith's wall-mounted deer head with resin antlers. In Australia, artist Julia deVille's creations include a cat stretched into a tiny area rug and a laughing pig bedazzled and painted white. “I'm not a morbid person, but I'm not afraid of acknowledging that I'm mortal,” deVille writes on her website, which also reveals that she has donated her body to the Institute for Plastination, where artist Gunther von Hagens prepares bodies for his famous Body Worlds exhibits. Just as von Hagens' touring show entranced and appalled audiences, the animal works on offer today are entirely about the human reaction, their creators say. “Situations” are certainly what Jay finds herself in when she wears a headpiece that Krausewitz has crafted for her out of a slick, black bird crest, the bird's beak still agape.